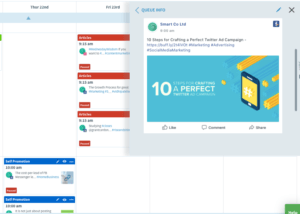 SmarterQueue streamlines your scheduling by using content Categories and a Posting Plan to generate a perfectly balanced content plan. 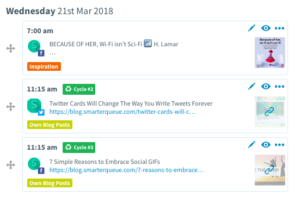 There are several ways to view your content schedule in SmarterQueue, but first, here’s what we’re doing behind the scenes. How does SmarterQueue decide what to post? How can I see what SmarterQueue is going to post? 1. Create a Posting Plan. Using your Categories, you define a Posting Plan, where you choose what type of content you want to post, and when. 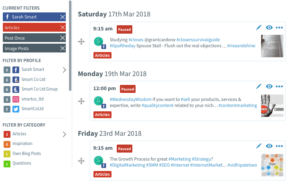 Simply set Timeslots for each social profile and Category. This is the template for your Posting Plan. 2. Add posts to your Queue. When you create each post we ask you to give it a Category (as well as choosing social profiles to publish it to). So when you add a Post to your Queue, we actually allocate it to a specific Sub-Queue for that social profile and Category. 3. We put your Posts into your Posting Plan. Each Post has been given a day and time depending on its social profile and Category. Looking more closely at the Inspiration Timeslots (Monday and Wednesday), the “Annual review time” post has been Queued before “Because of her” as it was put into the Queue first (Step 2). (You can find out how to re-order your Queue later). On the other hand on Wednesday at 11:15 am the Twitter profile and Facebook profile are sending different Posts from the same Category, because the Posts that were added in that Category (Own Blog Posts) were different for these profiles, whereas on Tuesday at 10am the Queued posts are the same for these profiles/Categories. This process carries on for as many posts as you add to the Queue, throughout the whole of the week. But this isn’t a schedule that expires at the end of the week. 💡Once Evergreen (recyclable) Content has been posted it will go back to the bottom of the Sub-Queue, ready to be posted again. 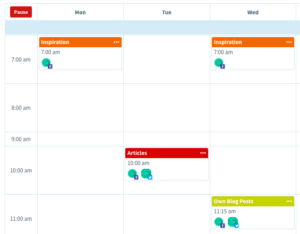 There are two ways to view which posts are scheduled and when: the Queue and the Calendar. 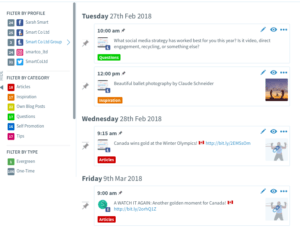 The Queue page shows all your upcoming Posts in the order they will be posted, including manually-scheduled Posts, One-Time Posts, and Evergreen Posts. It is generated by combining all of the Sub-Queues (Profile/Category pairs) and their assigned Timeslots (based on your weekly posting Schedule and the Timeslots you created). In this view, you can filter by profile, Category or profile + Category S ub-Queues. 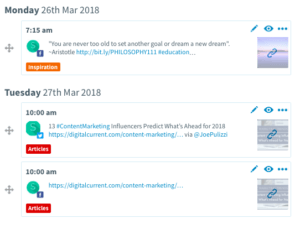 For example, you could view only Queued Posts that are for your Facebook Page, in your “Articles” Category, that contain images, and are One-Time Posts. 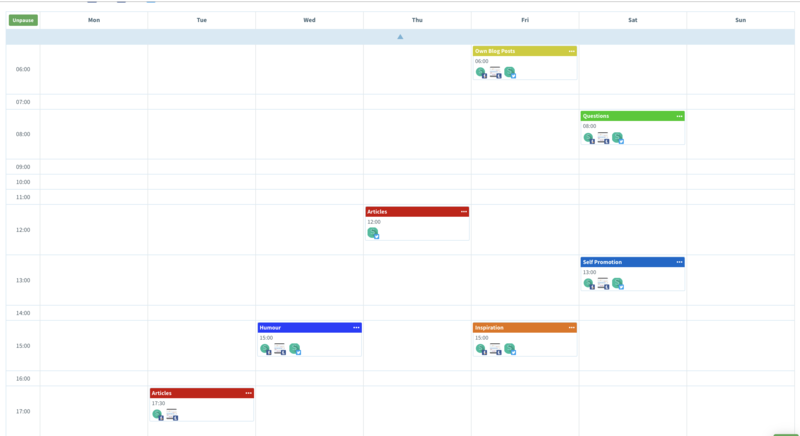 Alternatively, you can use the Calendar View to see your Posting Plan laid out by date. If you want to find out what is going out on particular dates, rather than simply what is posting next, then this is the view for you. Like the Queue view, you can filter by Profile, Category and Content type. 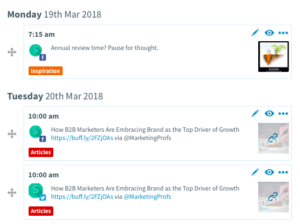 You can see at a glance which days and times have Posts scheduled (and their Category), then click to preview the Post.